I rarely wrap Christmas presents these days, preferring to use a decorated bag with fistfuls of tissue paper! In the days before I made cards, I would find myself running out of gift tags (usually on Christmas Eve when the shops had all closed!) so in the last few days I have been making some tags ready for December. The tag on the left uses the 2 1/2 circle punch and the Festival of Trees Stamp set and matching punch, with Garden Green and Real Red ink. The sentiment comes from the Endless Wishes stamp set. 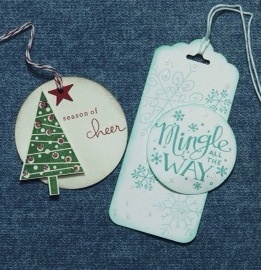 Whisper White card is used for the tag on the right, it measures 4 1/4 x 2 and the Scalloped Tag Topper Punch was used. I used Endless Wishes stamp set for the main part of the tag with Coastal Cabana ink and the ‘Mingle’ is from the Mingle all the Way stamp set in Bermuda Bay ink then punch out with the 1 3/4 circle punch. I hope you enjoyed these projects and feel inspired to make some tags yourself this holiday season.